The etymology of the word is unclear, but Patagonia came to mean “Land of the Bigfeet.” Magellan seized two of the younger males as hostages to bring back to Spain, but they got sick and died on the journey. 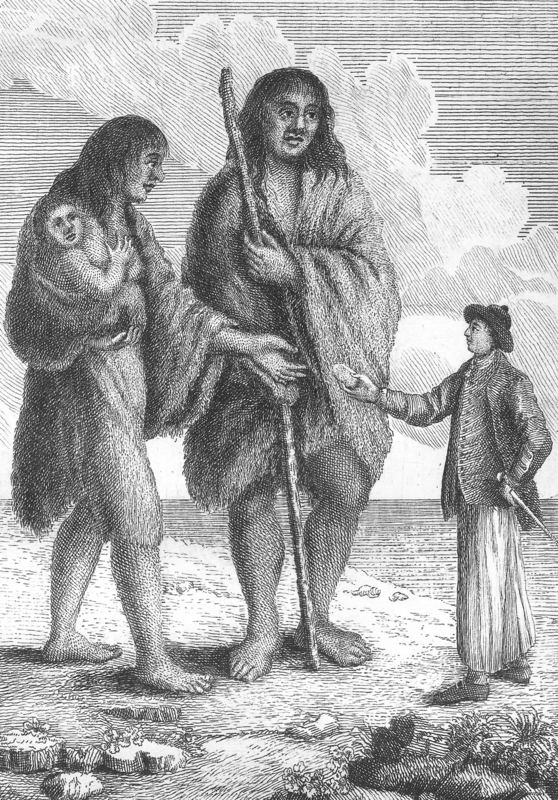 English sailor offering bread to a Patagonian woman giant. 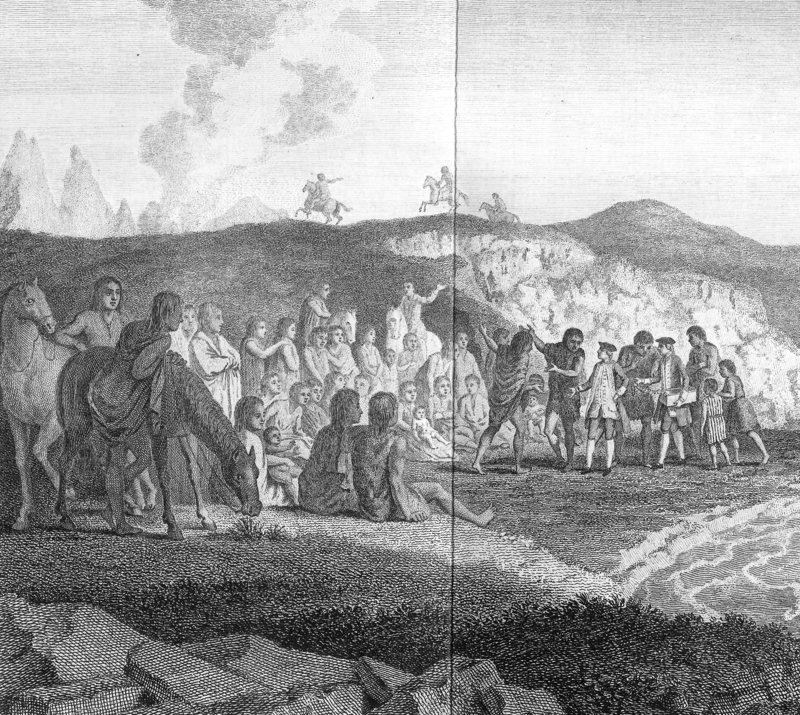 Frontispiece to Viaggio intorno al mondo fatto dalla nave Inglese il Delfino comandata dal caposqadra Byron (Florence, 1768), the first Italian edition of John Byron’s A Voyage Round the World in His Majesty’s Ship the Dolphin . . . (London, 1767) [Rare Books Division]. He reduced the height of the Patagonians from ten feet to seven and a half feet but was obviously more intent on discrediting the Spanish and blaming them for the “monstrosity” of the giants. Ironically, though, he was really confirming the basic facts behind the myth. In all probability, these accounts were describing the Tehuelche Indians, native to the Patagonian area of Argentina, who are typically tall—but not monstrous giants. Detail from “A Representation of the Interview between Commodore Byron and the Patagonians.” From volume 1 of John Hawkesworth’s An Account of the Voyages Undertaken by the Order of His Present Majesty for Making Discoveries in the Southern Hemisphere and Successively Performed by Commodore Byron, Captain Wallis, Captain Carteret, and Captain Cook . . . (London, 1773. [Rare Books Division]. *Antonio Pigafetta, Magellan’s Voyage: A Narrative Account of the First Circumnavigation, trans. R. A. Skelton (New Haven, Conn., 1969), 1:46–47, 50. **Sir Francis Drake (nephew), The World Encompassed by Sir Francis Drake . . . (London, 1628), 28. ***John Hawkesworth, An Account of the Voyages Undertaken by the Order of His Present Majesty for Making Discoveries in the Southern Hemisphere and Successively Performed by Commodore Byron, Captain Wallis, Captain Carteret, and Captain Cook . . . (London, 1773), 27–28, 31–32.